I’ve nattered on about this in the past, I’m a big Jamie Oliver fan. I’ve been watching his TV shows since the original Naked Chef series, but I’ve grown to admire the man for something beyond his ability to host a compelling TV show or put together a decent recipe. This dude cares passionately about food, and about educating others on food. He’s developed over the years into someone who is not merely sharing recipes, but sharing why food matters, why cooking from scratch matters and the importance of children learning to eat “real” foods vs highly processed ones. I watched as this one man tried to single-handedly change the way children’s lunches in Great Britain are prepared and served. I watched as he took that revolutionary attitude to a global scale. That passion to help and educate others moves Jamie Oliver out of the category of celebrity chefs I enjoy watching on TV and over into the much smaller box of heroes I admire. When Sobeys first announced it was partnering with Jamie Oliver I of course immediately took notice. I was excited to see a Canadian company working with this man whom I admire. I was also happy to see Sobeys stocking Jamie Oliver branded products, in particular the pasta sauces which I had been buying at a smaller specialty shop at a higher price. While I was pleased to see these sauces I enjoy, and several other Oliver branded products I’ve tried since, I was more interested in how this fit in with his overall “mission” of food education. I perked up when I noticed Sobeys new tagline of “better food for all”, and I got genuinely excited when I saw that their website now had a Jamie Oliver section full of interesting looking recipes which I was eager to test out. But when all of the pieces really fell together for me is when Sobeys announced what they are doing in honour of this year’s Food Revolution Day. The third annual Food Revolution Day is this Friday, May 16th. It’s an international movement started by Jamie Oliver with the goal of educating kids about food and inspiring kids all over the world to cook using fresh ingredients. I feel strongly that kids need to learn to cook. It’s one of those invaluable life skills, that is hopefully passed on from a knowledgeable parent. Sometimes my little ones test my patience in the kitchen but their enthusiasm is always worth the trade off for the added prep time. Also I definitely find them more willing to try new things and more willing to eat some things that might not top their favourite foods list when they help in the preparation. So what is Sobeys doing for Food Revolution Day? They are challenging Canadians to come together for Canada’s biggest potluck party and they are donating $1 to the Children’s Aid Foundation “Cooking for Independence Project” for every potluck photo shared online via Twitter or Instagram with the #PotluckChallenge and #FDR2014 hashtags. I love this! I think encouraging Canadians to host potlucks is a perfect way to celebrate Food Revolution Day; bringing people together, sharing food, and hopefully getting some kids involved in the cooking. Plus Sobeys will be supporting the Cooking for Independence Project, which aims to set up cooking workshops across Canada to teach kids to learn how to cook and promote a passion for cooking that will last them a lifetime. So how can you take part? Just pledge to take the Potluck Challenge by registering at www.BetterFoodForAll.com and promising to host your own potluck on or before May 16, 2014. Sobeys has promised to donate up to $25,000 to the Children’s Aid Foundation. So far only $1400 has been raised. That’s dismal. Get to it folks! Plan a potluck, host a potluck, or attend a potluck and share those potluck photos online via Twitter or Instagram with the #PotluckChallenge and #FDR2014 hashtags. Need some inspiration, or a little help planning? Check out Sobeys online potluck planning tools, they’ve got everything you need here: from electronic invites to coordinating who brings what, to party tips and recipes. We’ve got a board gaming themed potluck planned out for the May Two-Four long weekend. I’m a bit frustrated I couldn’t figure out a way to fit our potluck in before the May 16th challenge deadline, but I’m still excited to be taking part and I want to encourage you folks to consider doing the same (ok, not quite the same, try to squeeze it in by the Friday deadline!). So what do you say? 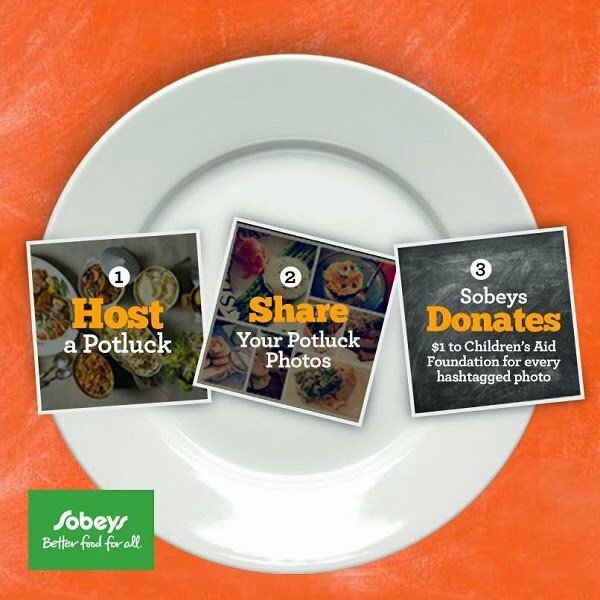 Anyone else on board with taking Sobeys Potluck Challenge? Disclosure: The author has received consideration from Sobeys or Sobeys’ media partners in exchange for this content. Sobeys has not reviewed these claims and is not responsible for the content. You know I loved Jamie Oliver – all his shows till this revolution. See it doesn’t deal with some of the roots of the problems for childhood obesity. A lot of it has to deal with money and I see a lot of it here in the maritimes.. it is cheaper to buy a 2 L of pop vs 2 L of milk. Parents can’t afford to keep milk in the house vs juices (well, drinks I should say as pure juices are out of cost range here too) and pops which is the same as other nutritious foods. Where do you go when you don’t have the cash to buy the better foods for your family? What do you do when you have to pay down large bills as well as feed a family. We need to find out a way to support that problem then better food would be easier for everyone to get. I’ve tried to follow along with Jamie Oliver because of how much I liked him and his cooking style when he started out, from his first date with his wife.